Separation wall denies local population means of livelihood and access to natural resources. Qalqilya, a city recognized as the West Bank’s "bread basket" has been suffering since August 2002 under Israeli government's plans to build the Annexation Wall surrounding the city. The Annexation Wall, built on confiscated Palestinian land, surrounds Qalqilya from three sides leaving a mall access to it. 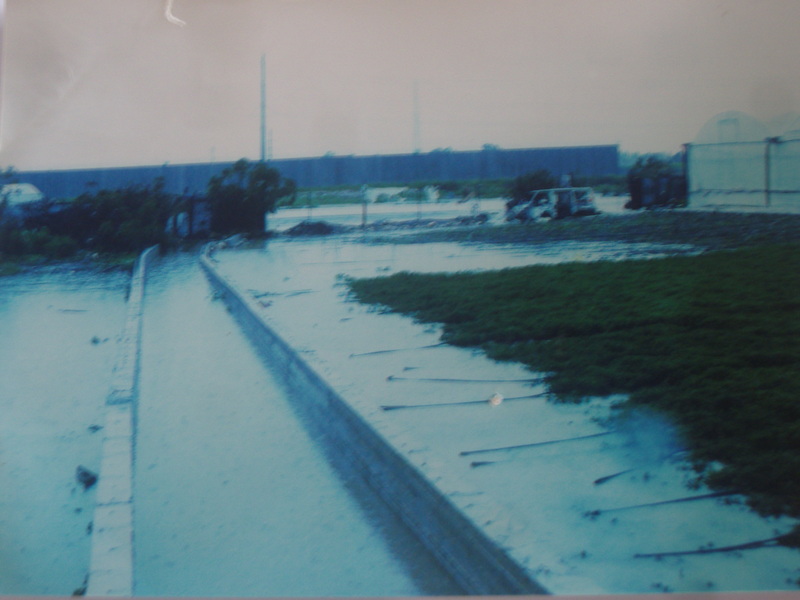 During winter the orchards flood, since the natural flow of water was blocked by the Wall, leaving Palestinian farmers to endure losses. The Annexation Wall is 8 meter high, also surrounded by a trench 4 meters wide and 2 meters deep, barbed wire and a military road patrolled by the Israeli Occupying Forces. In the area within 35 meters from the Annexation Wall, any Palestinian property, including homes, farms, fields and greenhouses or water wells were destroyed. The entrances to the city are blocked by Israeli military with the remaining entrance being turned into a military fortified gateway. 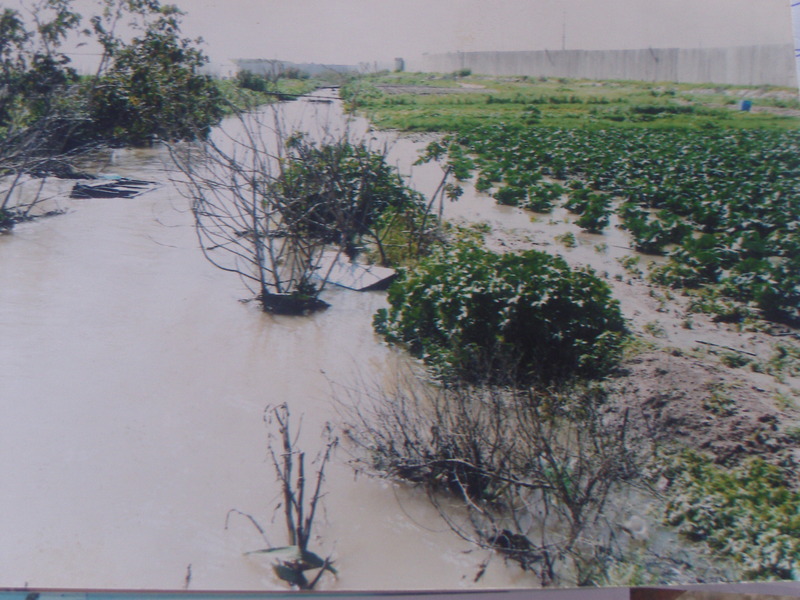 Considering overall figures of the land confiscation in this case, approximately 3,000 dunums (a dunam is 1.000 square metres) of agricultural land have been confiscated, representing nearly 50% of the city’s agricultural land. 19 wells in the city were confiscated (approximately 30% of the city's water supply). 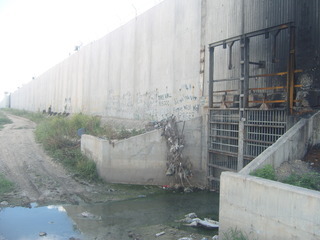 Due to the specific reliance on agriculture, land and water of the Qalqilya's residents, the impact of the Annexation Wall has led to an increasing impoverishment of the local population, denying them means of livelihood and access to natural resources, and also leading to an increasing migration out of the city. Forcing Qalqilya residents to migrate eastward, it eventually would make Israeli annexation of Qalqilya demographically "acceptable". A good illustration of suffering here is provided by a farming family we visited on the outskirts of Qalqilya. In that case we saw that the Annexation Wall bisected a small farm. 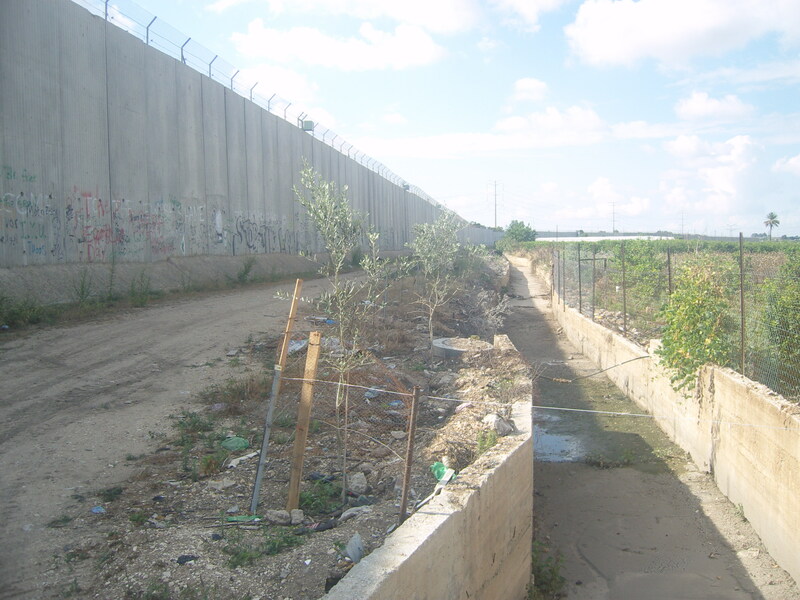 The water and drainage facilities (as well as much farming land) lay on the Israel side of the Annexation Wall. What remained of the farm was no longer adequately drained, and indeed it was periodically polluted by sewage from the nearby town that ‘backed up’ against the Annexation Wall, on the occasions when the sluice gate in the Annexation Wall were closed and controlled by the Israeli Occupying Forces (IOF). The Palestinians had no control over the sluice gate, and thus were at the mercy of the IOF as to its opening and closing, leaving the family powerless in alleviating the adverse conditions. Development of Alternatives It's difficult to imagine a solution to the problems created by the Wall without considering its total dismantling. Hydropolitics along the Jordan River, Wolf A.